Inclusive education is finally starting to attract the attention it deserves in American public schools. Inclusion improves outcomes, fosters social and emotional development and equips students for life outside of school. Despite its value, however, school districts still claim challenges to implementing full inclusion. Talk of insufficient resources, ill-prepared staff and myths about inclusion still exist to create barriers. The good news is that there are ways to overcome these challenges and move towards inclusive schools in every community. Let’s explore some ways in which we can make inclusion become a reality. The first common challenge to overcome is debunking the myths and misunderstandings of inclusive education. We need to provide educators, schools and communities with accurate, up-to-date information. For example, inclusion is not a service or program that is offered to a group of students. It doesn’t happen in a classroom nor is it an instructional strategy. Inclusion is an attitude that determines how we interact with one another. It drives our desire to include every student, regardless of ability, in meaningful learning experiences alongside their peers. The website, Wrightslaw, is an excellent place to start learning and sharing accurate information about inclusion. Newsletters, Parent Night, teacher inservice and videos such as Including Isaac can also help relay the meaning of inclusion. 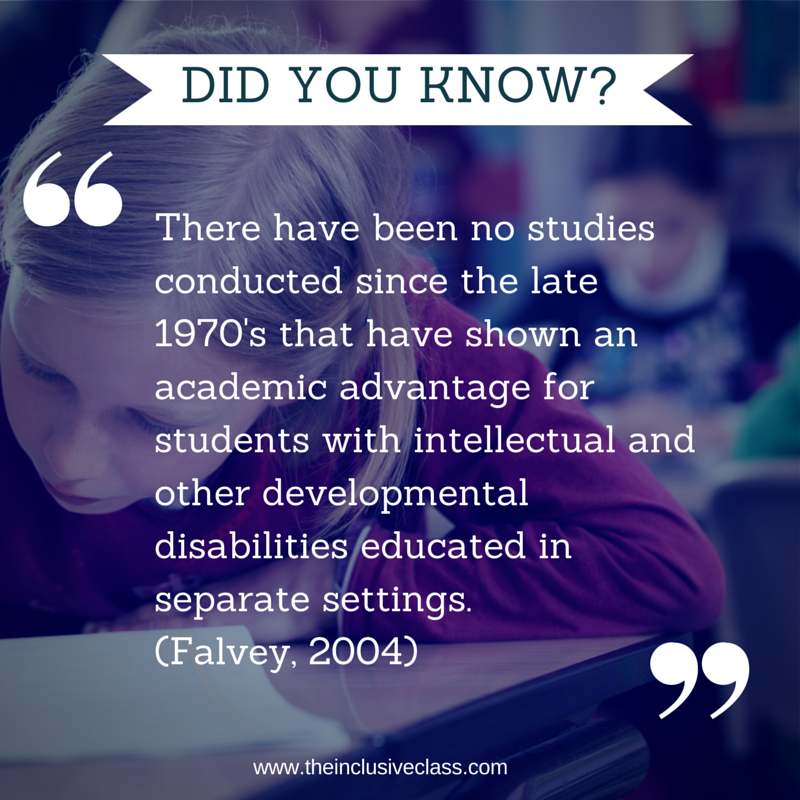 Furthermore, evidence reported by McGregor, G., & Vogelsberg, T. (1998) found that inclusion results in greater number of typical students making reading and math progress compared to non-inclusive general education classes, inclusion does not compromise general education students’ outcomes, typical peers benefit from involvement and relationships with students who have disabilities in inclusive settings, and the presence of students with disabilities in general education classrooms leads to new learning opportunities for typical students. 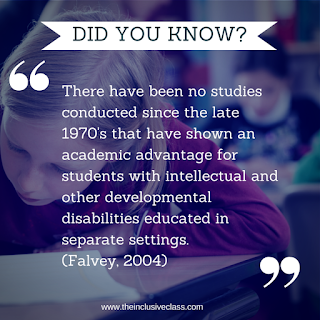 According to Falvey (2004), “There have been no studies conducted since the late 1970’s that have shown an academic advantage for students with intellectual or other developmental disabilities educated in separate settings.” It is clear that inclusion can be a significant benefit to the entire school community. 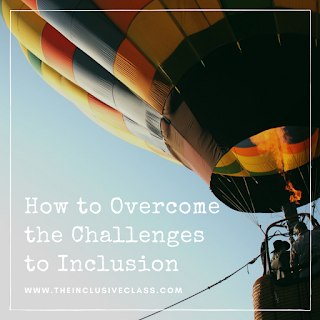 And, finally, the third most common challenge is understanding the mechanics of inclusion. Inclusion is like a car. There are many parts under the hood that work together to make it run smoothly. One of the most important parts is having the support of school administration and staff. The adults in the building help set the tone of an inclusive school - from the principal to the bus driver, the playground supervisor and the classroom teacher. 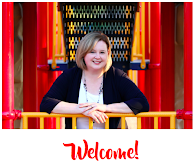 They are friendly, welcoming and make inclusion a priority in all school activities. In fact, many inclusive schools institute a school-wide character education program, in which staff, students and families participate. This helps reinforce the common goal of inclusion. 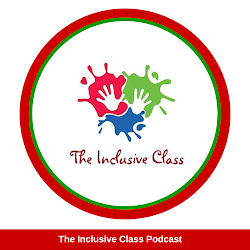 Another important aspect to inclusion is ensuring that the general education classroom is where a student receives the majority of his/her educational needs. 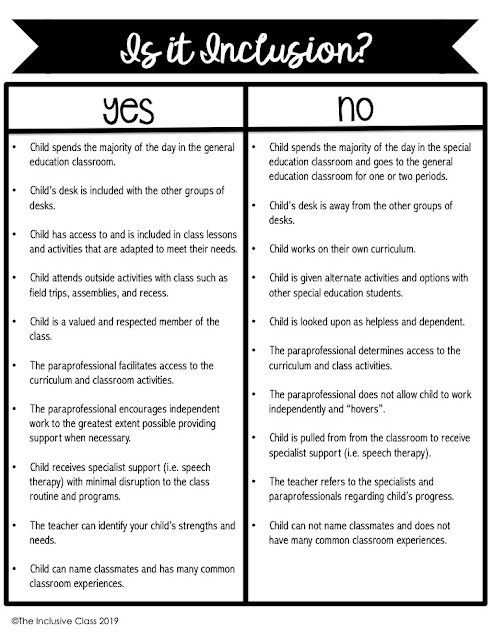 Special Education teachers and Paraprofessionals offer their support, as outlined in the student’s IEP, while the classroom teacher makes accommodations and/or modifications to the curriculum. There may be some need for focussed instruction outside of the classroom, which usually happens during the least disruptive time of day. In addition to curriculum, materials and resources are made accessible to all students. Varying levels of text, visual supports, manipulatives and assistive technology are woven into the class program. 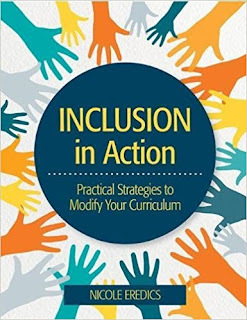 For ways to implement these strategies, you can look to Brookes Publishing Company where there are a great selection of teacher guides for the inclusive classroom. 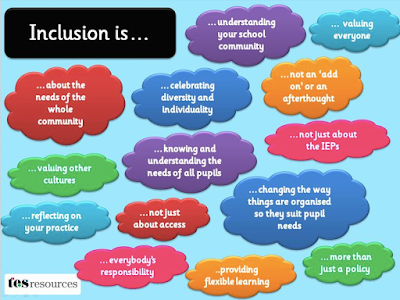 Lastly, inclusion involves the work of parents and families. Communication between home and school is essential to making sure the student is learning and thriving in the classroom. It should be a consistent, pro-active arrangement where information is shared between the family and classroom teacher, that is for the benefit of the child. Depending on the child’s needs, daily, weekly or monthly updates is required beyond the yearly IEP meetings. Setting up lines of communication such as email, a “communication book” or phone calls, can facilitate an on-going conversation about the child’s progress, challenges and needs. Inclusive education is a belief system that values a child’s abilities first, not their disabilities. Because it involves the entire school community, there are challenges that can be faced. However, knowledge, discussion, access to resources and support, along with ongoing communication, can help those challenges feel surmountable. Children of all abilities can then truly have equal access to a free and appropriate education. Staub, Deb. "Inclusion and the Other Kids." National Institute for Urban School Improvement, 2005. Web. 25 May 2015. <http://www.urbanschools.org/pdf/OP_Kids.pdf>. McGregor, G., & Vogelsberg, T. (1998). Inclusive schooling practices: Pedagogical and research foundations. Baltimore: Paul H. Brookes. Falvey, M. (2004). Towards realizing the influence of “Toward realization of the least restrictive environments for severely disabled students.” Research and Practice for Persons with Severe Disabilities, 29(1), 9-10.